I am happy to announce that the 13th issue of The Funambulist Magazine, entitled “Queers, Feminists & Interiors” is now published and available online and very soon in our partner bookstores. This issue presents a critique of the normative violence of gender in the specific context of indoor architectures. 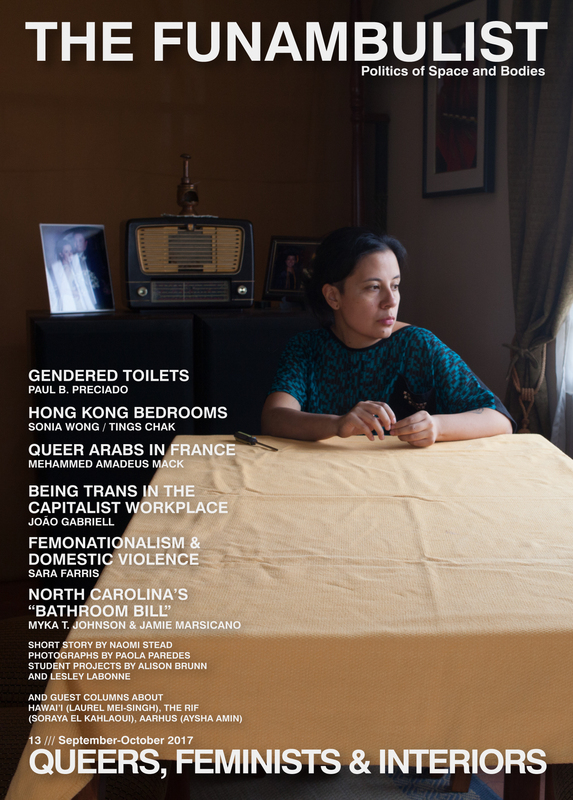 It engages a dialogue between trans perspectives on public bathrooms (Paul B. Preciado and Myka T. Johnson & Jamie Marsicano) or the capitalist workplace (João Gabriell), the demagogic blindspot of femonationalism when violence against women is deployed in domestic spaces (Sara Farris), the clandestine alternatives to white “gayborhoods” for queer Arabs in France (Mehammed Amadeus Mack), the impossibility for young Hong Kong lesbians or, to an even higher degree, female migrant domestic workers to access “a room of one’s own” (Sonia Wong and Tings Chak), the violence of the norm in the design of all rooms and furniture (Léopold Lambert), or the far-from-neutral space of the coming out (Paola Paredes). The non-topical part of the issue also presents articles on the demilitarization struggle in Hawai’i (Laurel Mei-Singh), the Moroccan political movement of the Hirak in the Rif (Soraya el Kahlaoui), and life as a Dane of color in stigmatized and gentrifying neighborhoods (Aysha Amin). READ MORE, ORDER A DIGITAL OR PRINT+DIGITAL COPY, OR ACCESS THE ONLINE VERSION (subscribers). See the index and the section “behind the scenes” after the cover. This thirteen issue of The Funambulist Magazine begins our third year of publication. One of the things we wanted to bring to this new beginning is a small platform to give you regular updates about what is happening “behind the scenes” of the publication. In July 2016, I had the opportunity to give a talk entitled “Political Friendships” at the Onassis Cultural Center in Athens, which aimed at presenting the logistics behind the magazine (the office, the reception of a little less than a thousand printed copies every other month, the subsequent trips to the post office, etc.) and, more importantly, the political and ethical decisions that The Funambulist’s daily operation involves. Some were fairly evident because directly linked to the editorial line of the magazine: who should be commissioned to write about what? Where are they located? How do they challenge the imposed hierarchy of knowledge holders? Which geographical areas have been described at length and which ones, not enough? Etc. Less obvious aspects of the daily practice were also introduced. How much of the budget can be dedicated to commissioned articles, photographs, and drawings? 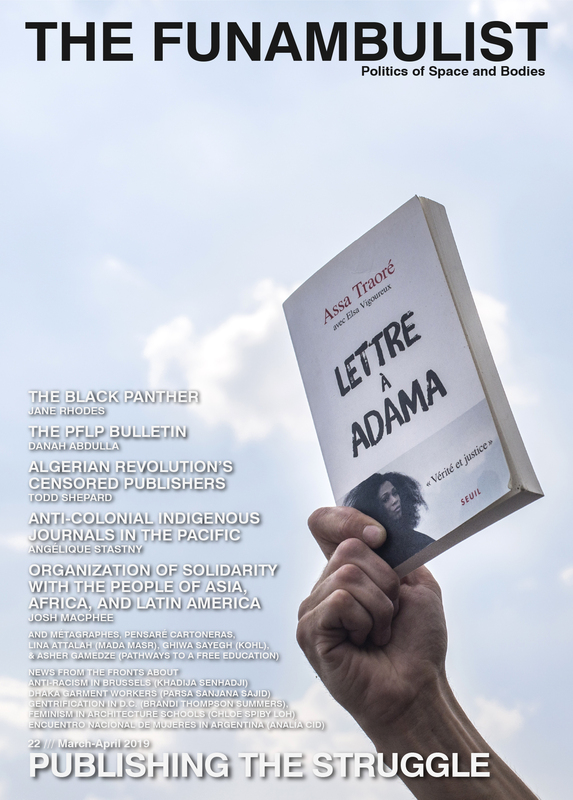 What should be the price of the magazine and how can this price be divided by two when selling it in bookstores of Southern Europe and the Global South? How to learn to negotiate to be paid and “run a business” while keeping a high degree of critique towards capitalist logics? Etc. None of the answers of these questions can be the source of a resting satisfaction. 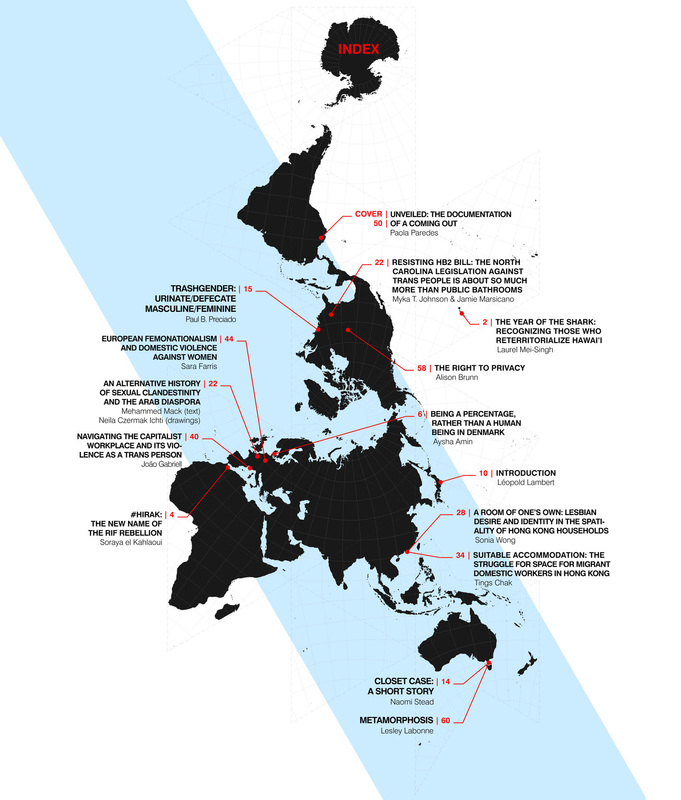 An important number of geographies have been described in the first thirteen issues, but Latin America, the Carribeans, and East Africa were only ‘given’ a handful of articles. Commissioned contributors and photographers are paid for their work, but the sums are nowhere close to meet their actual efforts and the time spent to produce it. Bookstores in Mexico, Portugal, Nigeria, or Hong Kong get to sell the magazine for 50% of the normal price, but the latter (12 euros) remains prohibitive for most people. is not verifiable) is more obvious, despite the illusion of dilemma that the prospects of an easier option produce. In a system that perseveres each day in pushing for such easier, more profitable options, we believe that a balanced economy, operating under our own political terms can be reached, despite the many difficulties that it implies. But who is this “we?” As of today, it is Noelle Geller and Flora Hergon, who work part-time in assisting me in the editorial and logistic process of the magazine at the office in Paris. It is also Maxwell Donnewald who, on the other side of the ocean (New York), copy-edits and proof-reads the majority of texts published in the magazine. Closer from us (London), Sofia Ilyas and the small company she founded, Float PR, give us some occasional help, while Marlow Perceval and Francis Redman, the designers and programmers of the website, take care of its cogs and devices. Finally, this “we” is also incarnated by the many friends who are often solicited to write articles, find student works on a given topic, give their opinion about which cover works best, request for the third time that their university take a subscription, or more simply, listen to the occasional hardships of this daily practice. This is the reason behind the title of the 2016 talk “Political Friendships” mentioned at the beginning of this short text. What such a title tries to convey is the shared passion and solidarity that the 155 contributors to the magazine, the editorial team, the various bearers of support (be it money, encouragements or hugs) to the project, and, I dare to think, the subscribers and occasional readers, construct through and for the political struggles in which we are involved. My hope and ambition for this editorial project is for the various problems involved by its daily construction to be transcended by the force of such friendships, and the political effects to which it humbly attempts to contribute. As for this small tribune, my hope for it is that it will provide an additional layer to your reading of the following pages; a usually invisible one, made of the hundreds of small (and less small) decisions taken on a daily basis to finally reach this point of presentation once every two months.